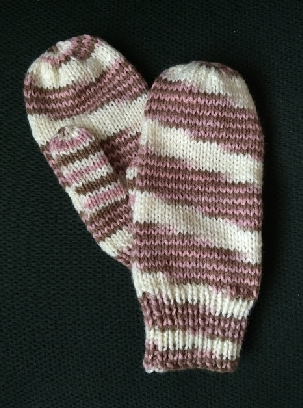 For those who would like to try a simple pattern with yarn pooling (or color pooling) using variegated yarn, these mittens are the perfect project. Simple construction (as simple as mittens can get) and a diagonal color pattern created by the yarn itself -- what can be more fun? Note: Both gauge and specified yarn is extremely important for the swirl pattern to work as pictured. Materials: 1 (3.5 oz.) skein Loops and Threads Impeccable yarn, color Neopolitan; double pointed needles, sizes 6 and 8 (U.S.) or long circular needles for Magic Loop Method; 24-inch length of scrap yarn; 1 stitch marker; tapestry needle for finishing. With size 6 needles, cast on 38 sts. Being careful that sts are not twisted, join into a round and place a marker to denote beginning of rounds. Work (k1, p1) around until cuff measures 2 1/2 inches (or desired length of cuff). Change to size 8 needles and KNIT around for 1 1/4 inches more, ending at marker. Thumb Opening Round: k2, with scrap yarn, k6. Turn, p6. Turn. Leave both ends of scrap yarn hanging free. Scrap yarn will be left in place while remainder of mitten is worked. PIck up working yarn again and continue knitting in rounds until mitten measures 6 1/2 inches from TOP OF RIBBING. Decrease Round 1: (K2 tog) around. Decrease Round 2: (k2 tog) around to last st, k1. Cut yarn, leaving an 8-10 inch tail. With tapestry needle, thread yarn through sts on needle and pull tight. Fasten off and weave in end. Using tapestry needle, gently remove sts of scrap yarn. Using size 8 needles, insert needles in bottom 6 sts of thumb opening, and top 5 sts of thumb opening, distributing sts evenly around. Attach yarn and knit, picking up 1 st at each side of thumb opening to close the gap. Continue knitting in rounds until thumb measures 2 1/2 inches. (K2 tog) around, knitting last single stitch.